“Athithi Devo Bhava”…“The Guest is always right”…“Guest is God” are some of the mantras that the hotel industry stands by and goes that extra mile to ensure that the community follows. It’s a known fact that the guest is the reason why the whole Hotel Industry is in business. The guest has the power to take away business from you by spending elsewhere, so it’s just right that the hotel channelize all their efforts in ensuring that the guest experience should be one of the biggest investments that they make. Though the guest is physically not at the hotel at this stage, but great service begins at the website, advertisement, and social media page, wherever the guest can see or interact with the hotel. The information available must be up-to-date and accurate. Once the booking process is complete, follow-up is essential which can be either through an e-mail or a phone call. At this stage the guest can be provided with lot of information and one can also obtain information from the guest to make their stay more comfortable. The best time to hugely influence the guest decision, that they have made the right choice by staying at your hotel. Having a room ready for the arriving guest is one of the most important things during this stage. 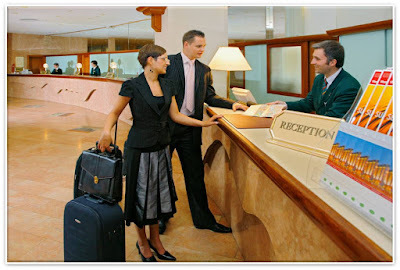 Getting away from the counter so that the front desk agent is in close contact with the guest, a sit down check-in counter, welcome letter in guest room, pleasant staff and courtesy calls once the guest is in their room all adds to guest experience. Utilize every opportunity to interact with the guest. This need not be just limited to the Guest Relations; staff across departments can also interact with guests for feedback. Addressing a guest by name and creating a comfortable ambience leads to an overall satisfied stay. It is also the best time to ask for a review or a check-in update on social media from a guest. A lot of millennial travelers prefer posting updates during their stay. Be pro –active, ask guest about their stay, make certain that the departing guests are happy. This is the best time to suggest regarding loyalty programs and if they can do an online review. Collect personal details about the guest like their email id, contact number and social media handles. A mail thanking the guest once they have checked-out will definitely help in converting the guest to a loyal customer. This will help strengthen positive feelings about their stay, therefore resulting in a better chance of a review or a return visit. Keep networking with the guests on a regular basis through social network and personalized emails. Let them know about events, packages and discounts prevailing. It would be good idea to wish them on important occasions.